one of the things that i instituted in the bad old days of my registrarship still puts a smile on my face when i think back. it was my worst rotation. not the work but the head of the firm i was running. he tended to lose it sometimes and rip into one, sometimes for no clear reason. there was also usually no reprise. the entire firm had been struggling under what was viewed as a fairly oppressive regime. the particular consultant was a typical surgeon. bombastic to the extreme. often cruel with the students (in my opinion anyway). but he also had the typical inflated surgeon's ego. he once openly claimed that he could keep up with the young bulls even though he was getting on in years. he meant on calls, which was a bit of a joke because he would typically get called out only about once every two months, wheras the 'young bulls' would typically work right through the night, through the next day and way into the next night on every call. as usual i digress. anyway. one day on the post call round after a particularly strenuous call with the entire team totally exhaused, he had some or other complaint. he went at me. i replied 'ja prof. jammer prof' (yes prof. sorry prof). he kept on. i tried silence, seeing that to apologise didn't work. it also didn't work. he just wouldn't stop. the students, luckily were sympathetic with me because we had a strong feeling of unity and team spirit based on what we had been through together, much of which was at the hands of the prof. so actually the prof was just moving himself down in their estimation. usually that knowledge would have been enough for me to just take his tirade, but with such a heavy call behind me and with exhaustion from weeks of his constant attacks, i felt my anger rising up. i became nervous i was about to do something stupid (to punch the prof would be something stupid). as luck would have it, we reached the base of a flight of stairs. i just thought i need to get away from him. i moved quickly up the stairs. i looked behind me. the prof was keeping up. suddenly i realised his ego wouldn't have me beating him up the stairs. an evil smile crept onto my face. i pushed, but not too hard. just enough to be in front of him and create the false impression that he was holding his own against the 'young bull'. the students were way behind. this we kept up for three floors of stairs. by the time we got to the top, the prof couldn't talk because he was so out of breath. even then he made a point of trying not to pant too obviously. i was gleaming. the students looked forlorn, but that was only because they didn't know what had just happened. after those rounds, i called the students around me. i told them that from now on our post call entertainment would consist of exhausting the prof on the stairs. sure enough, next time around, the prof tried to keep up. the only difference was an excited body of students all around rushing full speed up the stairs. in fact this became a regular occurrence on every rond. the prof never realised what we were doing. i think that is as it should be. it was not too noble of us, but in the context of that time and the type of sh#t we went through i think there may just be a small arguement to justify our behaviour in the name of sanity. our good minister of health, manto, has just been exposed in the media as being a drunk and a theif. she just received a liver transplant which at the time was attributed to autoimmune hepatitis. 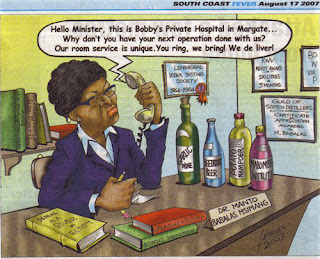 it seems she got the liver because she was the minister. she is more important than other south africans, it seems. she apparently was convicted in botswana for stealing and banned from that country for 10 years. this is the person who had persistently denied the link between hiv and aids and promoted beetroot and garlic as better treatment than antiretrovirals. so you might understand my enthusiasm at her possible downfall. possible??? yes, because our president stands behind her. actually the entire anc (the government of the day) is standing behind her at the moment. you see she is entitled. her personal interests are, after all, more important than the public. in fact the anc lashed out today against the media, actually citing her right to privacy (not being exposed as a convicted thief and drunk and jumping the que for a liver transplant) as more important than public interest (they actually said that). difficult to explain, but other than the obvious ridiculous picture painted, i am really excited about the whole thing. it is the first time in a long time that reason may (yes may and not yet will) prevail. just a quick update. i'm happy to announce that the patient posted about in the two previous posts has been operated and is doing well. things transpired slowly, but at least they did transpire. after i left, the patient lay in the icu for a week before they mannaged to get an icu bed available in pretoria. just before she went there, there was another amazing administrative blunder. the pretoria icu bed became available over the weekend. because the transfer was from one province to another, the pretoria people insisted that the super from this hospital give final consent. (this has to do with who will be paying in the end, mpumalanga province or gauteng province). the icu doctor phoned the ceo of the hospital who was the super on call to give the ok. she stated that it was not an emergency and could wait until the morning. unlike me she hadn't seen the patient lying with a tube in her throat and fear in her eyes. her sleep meant more to her than the patient. so another day went by. fortunately the next day the icu bed in pretoria hadn't been taken and the patient was transferred. in pretoria the patient got her operation. i'm surprised to say that it was done cervically and no sternotomy was needed, so both sid and buckeye were right. thanks for your input, guys. anyway, although there was more than a week's unneccessary delay, all's well that ends well. it took me a while to get around to watching it but what a worthwhile movie. there were a few things that i think i as a south african probably appreciated more than most international viewers. for one, the accent that leonardo pulled off and maintained for the whole movie was almost spot on. not just the accent mind you, but some of the idiosyncracies of how south africans talk. brilliant. but the one line that really hit home was when they said "tia" (this is africa). that was the blanket phrase excusing all the monstrocities that this continent can dish up. for those of you who read my last post and it's comments will know i was recently a first hand witness to exactly that. tia. i have mentioned before that life is cheap in africa. but the truth of the matter is the people that make life cheap make sure it is other people's lives that are cheap, not their own. a recent illustration of this was recently when our illustrious government so steadfastly refused to admit the link between hiv infection and aids. they therefore refused to supply the populus with the much needed drugs, even claiming the drugs were killing the people, not hiv. bearing in mind the people weren't getting the drugs, the logic is difficult to follow. but some of the self same politicians, on medical aid obviously, themselves were taking antiretroviral treatment. they weren't willing to take the individual chance of dying, but they were quite willing to force thousands of others to do just that. the patient in my previous post still has not been operated or transferred to a center where she can get the necessary care. i doubt she will. this despite the fact that i personally phoned the super and expressed my willingness to operate her free of charge even though they had officially banned me from working in the state hospital. the point they want to make against me is more important than the patient's life, so they didn't consent. and what is the point? the fact that i continued to supply a service there despite their laxness in giving me a legitimate post paints them in a politically bad light. they would rather give the appearance of not having lost control than welcoming any help in a desparate time. yes, this is africa and life is cheap, but i can honestly say the fact that i have been barred from helping this specific individual is absolutely devastating to me. i just can't see that it is worth it to sacrifice her for their point. not the greatest picture, but i took it with my cell phone. massive thyroids seem to be the order of the day. this lady's supposed "asthma" got so bad they had to intubate her. on the ct note the retrosternal mass totally displacing the trachea and esophagus. note the aorta arch as well as the superior vena cava. i'm thinking sternotomy, but i'm open to suggestions. one of the advantages associated with living so near the kruger national park is the fact that i know people who live in or have lived in the park. their stories are sometimes amazing. just next to skukuza camp is skukuza village, an unfenced residential area for people who work in the park. before the 2000 floods a friend of mine lived next to the stream running through this village. (after the floods he lived slightly higher up) he told me such a riveting story. one night he and his wife were asleep. late that night a pride of lion mannaged to corner a buffalo in the river bed. they finally pulled it down and killed it, just outside my friend's bedroom window. he and his entire family lay awake, watching through the window while the lion ate their full, occasionally having to chase off the constantly pestering hyenas. he assures me the entire thing is a noisy affair and you can pretty much forget about sleeping. what an amazing story!! who would want to sleep anyway?